Draw and paint female wizard step by step. This video tutorial show you how to paint a female wizard with Photoshop. You can scroll down further to see step by step images with instruction. Well, she is not actually a wizard but sort of inspired by a super natural Kung Fu master character from a Wuxia novel 射鵰英雄傳 -pinyin: shè diāo yīng xióng zhuàn or Condor Heroes. 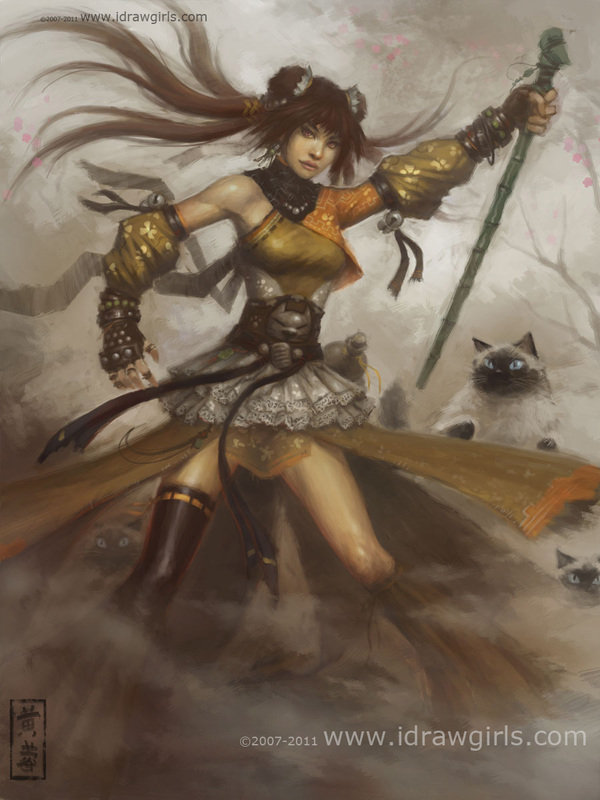 I decided to redesign and remake the whole illustration of the female character (Wuxia inspired). The previous one wasn’t bad but this one is for sure better overall. I basically re-drawn her post and re-arranged the composition of the illustration to make it a lot more dynamic and interesting to look at. It gives a character design a lot more personality and attitude. Again there is not yet a video tutorial for this one. Just the step by step process for now, I hope you will enjoy this series of tutorial. I am taking it up a few notches. This character design is basically is loosely base on one of my favorite character Huang Rong (黃蓉) or shorten as Rong’Er from the series called Condor Heroes (射鵰英雄傳 -pinyin: shè diāo yīng xióng zhuàn)a classic Wuxia novel of Jin Rong or Louis Cha (查良鏞). Since the original character has a weapon called “Dog Beating Rod”, I decided to put it here also to keep it somewhat close to the original description. Here is a final version of Huang Rong (黃蓉) aka Rong’er the character inspired by a Wuxia novel of Jin Rong or Louis Cha (查良鏞). Below are step by step how to illustrated and design a character. This painting takes me about a few days on and off. Continue painting step by step down below.